The funeral is a tribute or celebration of a life: a life of relationships, achievements and interests. Nothing can take away the shock and sorrow of death, but a respectful, genuine and professional funeral ceremony can ease the pain. I will work closely with you to ensure the ceremony is what you want it to be – a meaningful, memorable tribute that honours life, contributions, values and beliefs. 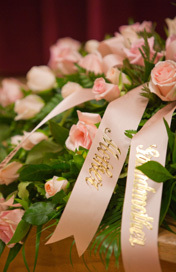 The eulogy, readings, symbols, photographs, music – are all considered, prepared and checked with you to ensure the ceremony is worthy, sincere and responsive to your wishes. The ceremony allows you, your family and friends to be involved and demonstrate their love, support and understanding. It draws people together at a time of emotion and celebration of life.